Sorry no Stampin' On Friday video today,Ethan had the flu yesterday so I was nurse mom all day and didn't get a chance to film. I was using it for stamps but in my attempt to make my room flow better and have everything in one spot I decided to move all my stamps (except Ali Edwards, those are on my desk) to one location and start getting all my embellishments in another. Since embellishments take up the most room I decided to move everything to my Alex unit from Ikea and the clip-it-up that sits on top. 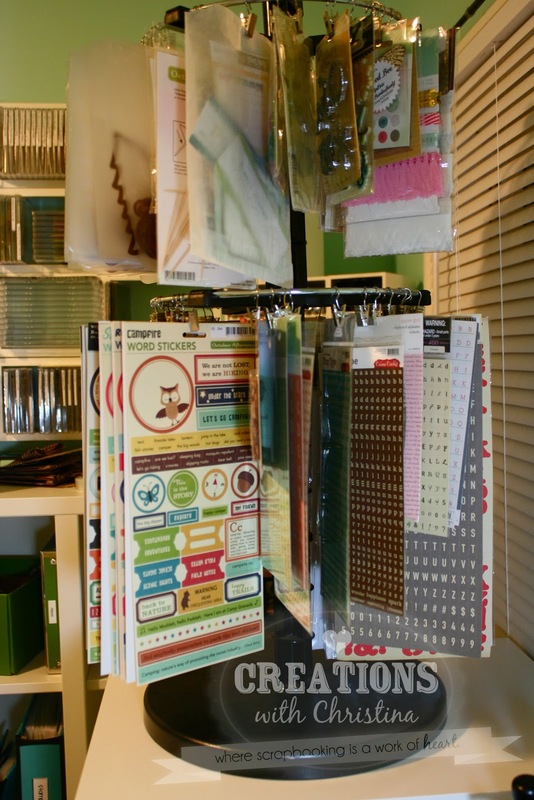 One the bottom row I have mostly my alpha stickers and journaling sheets. 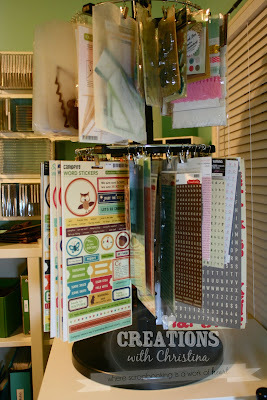 Then the top row I used it for my newest embellishments or my favorites that I plan on using soon. These are the sheets I picked up at Office Max. Thats all for today. I hope you all have a great weekend. Hope Ethan is feeling better today. Hope Ethan is feeling better. And I like your idea for the clip it up and having al your embellisments in the same spot. Great idea. Sorry to hear Ethan was sick. Thank for sharing your great ideas. I hope Ethan is better soon. I so wish I could afford the Clip It Up, but I ended up making my own. 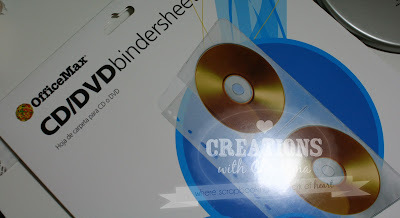 I do love the CD Binder sleeves--those will come in handy for me as well. I've got to buy some. TFS and I do hope your son is feeling better soon. 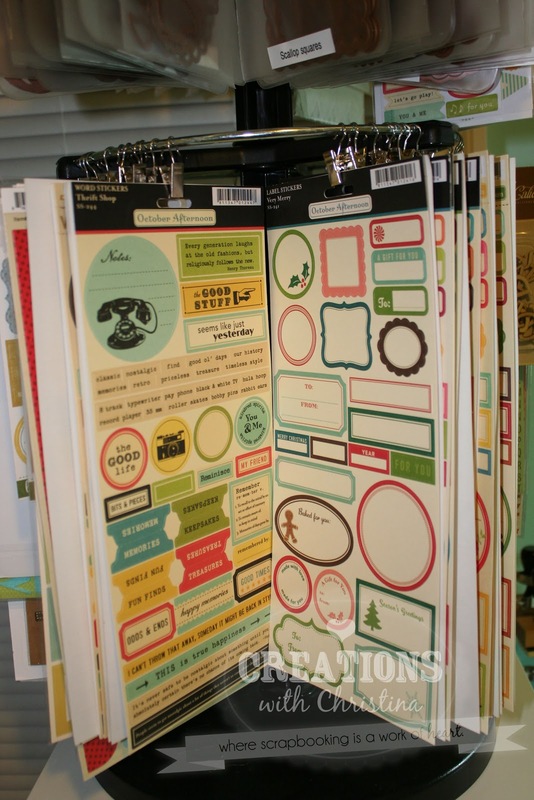 Lori, there is a much more reasonable version of the Clip It Up now at Michaels, and you can use a coupon... plus it sits on top of that cool white carousel that you put all your other goodies in! Thank you, Thank you. I have these same CD holders and have my dies in a binder and don't like it. I was going to get rid of my Clip it Up, but not now. I have a new way to store my Quicutz and other dies. I just got my clip it up before Christmas and I also just love it, I feel so organized now, I found things I didn't even know I had. LOL! Hope the little guy is feeling better today and thanks for the tip with the CD holders. hahahah Christina! I was laughing so much at your comment now! yes, sooo happy! Cant wait to play with it. 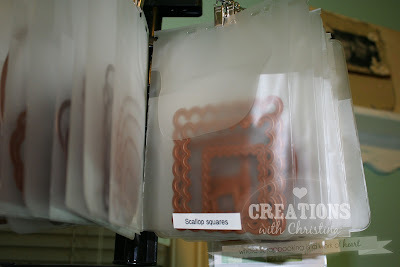 And YES, this is the way I have my dies/clings & stamps too. Mine are also from Office Max. I got the idea from Nichol. 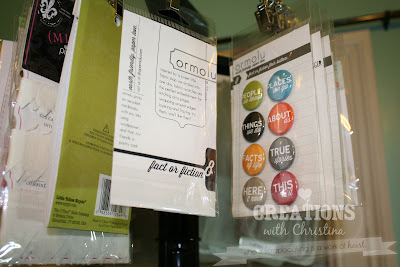 Did you see how she stores all her dies & stamps on the big Clip it up? Love it! I saw that and I heard the angels singing! So sorry to hear Ethan was ill. Best Wishes to him and to you! Thanks for the wonderful ideas you share with us! I would love to see more. I love organizing. I hope you keep showing us more. I hope that Ethan is feeling better. I love the CD holder idea! I am going to have to run out and get me some. Thanks for sharing! Sorry to hear Ethan has been sick... Hope he is feeling better soon. 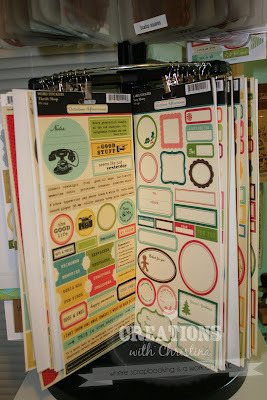 Would love to see how you are organizing the stamps now. I love my Clip it Up, too but I do use it for my clear and cling stamps. (Well, not all of them, of course!...all my Unity stamps are in binders although some are in a box I'm growing out of, LOL!) This is inspiring me to reorganize my stamps, though...I need to remove some of the stamps I never use and refile those somewhere. :) Or maybe I just need a second Clip it UP! LOL!! !